Interested in purchasing a signed book? 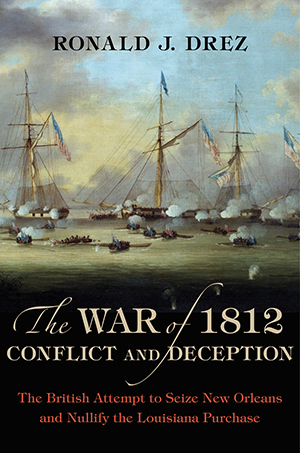 The War of 1812, Conflict and Deception: The British Attempt to Seize New Orleans and Nullify the Louisiana Purchase released. and Their School in Louisiana released. Heroes Fight Like Greeks released. Packed with personal testimony and many rare photos. Voices of Valor added to the New York Times Best-Seller List. Remember D-Day added to the School Library Journal Best Books of 2004 List. Ron Drez is a decorated combat veteran of the Vietnam War and a former Captain of Marines. He is an award-winning, best-selling author and commander. He is President of Stephen Ambrose Historical Tours having served both as friend and associate of the distinguished, late historian. Now businesses, clubs, associations and classrooms can step back into American history with stimulating lectures, roundtables, and presentations. For those who want the ultimate history experience, join Ron on many exciting tours. Western Battlefields of the Civil War; D-Day to the Rhine; The Corps of Discovery  Lewis and Clark; The Italian Campaign and Band of Brothers. Over twenty years of leading the Eisenhower Centers oral history project has brought this distingquished author into contact with the veterans of WWII. Of note was his initial discovery and interviews with the Band of Brothers which he chronicled in a special edition of WWII magazine entitled, Finding the Band of Brothers.